Twitter was founded on March 21, 2006. Many of the early adopters have years of tweets and relationships built on this communication platform. We’ve noticed that the number of administrative professionals have been surfacing on Twitter has been increasing. With more assistants and professionals advocating for and teaching others how to use this valuable communication tool, assistants are seeing the value and deciding to jump on board. In fact, there is an event called #AdminChat that’s just for assistants – a free event that happens with a select resource, weekly, hosted by Executive Secretary Magazine (another phenomenal administrative resource). Whether you are already on Twitter or you still considering the possibility of joining, you will want to know who the must follow admin resources on Twitter are! We’ve compiled our list for you to help you get started. Their Twitter handles and bio follows. @officerenegade Champions the importance of competent, dedicated administrative professionals in the workforce. Love coffee, NHL, NFL, DC & Boston. I tell redonkulous stories. @julieperrine Founder of Julie Perrine International & All Things Admin | Administrative & Leadership Expert, Mentor, Speaker & Trainer | Myers-Briggs Type Indicator Admin – Julie’s a great resource for assistants on tech skills, how to use today’s platforms for better connectivity and collaboration with your peers and as well as provide greater benefit to your organizations. Julie will be speaking more on this subject at the Annual Conference for Administrative Excellence. @lucybrazier CEO of Marcham Publishing – Publisher, Speaker & Conference Chairperson. Finalist – PPA Independent Publisher’s Business Magazine of the Year 2013 – Lucy has been a supreme collaborator and provider of quality content for administrative professionals. She can be found speaking at administrative conferences and events around the world. In fact, Lucy will also be at our Annual Conference for Administrative Excellence. 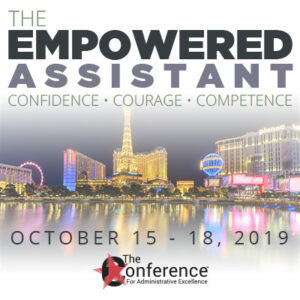 @IAAP International Association of Administrative Professionals – The largest association for administrative professionals. Follow for relevant profession-related articles and resources. @GrammarGirl Podcaster. Author. Entrepreneur. Skier. Founder of the Quick and Dirty Tips network. Grammar Pop developer – Every assistant needs to have Grammar Girl, Mignon Fogerty on speed dial. Her books, website, podcast, and tweets are worth keeping close by. @Coursera Learning without limits. We aim to offer education to everyone. Take the world’s best courses, online, for free. 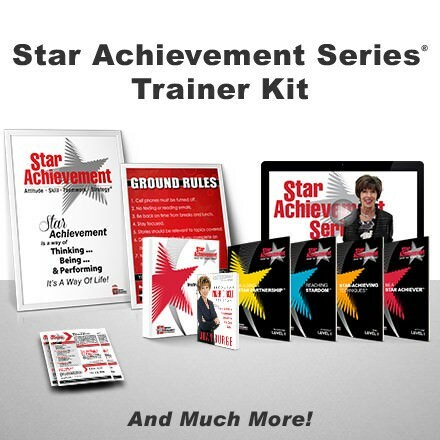 – I love this resource for keeping my skills updated and continued learning. The price is right, too! Take college-level courses for nothing? Sign me up. It’s been completely worth it. @MelissaEMCT Specializes in transforming those confused by technology into empowered users of these powerful software tools. @EliteMeetings We help meeting & event planners find qualified hotels & resorts for their events through our complimentary, commission-free search & RFP engine. @JulieMorgenstern Organizing and Time Management expert, New York Times best-selling Author, Consultant, and Speaker. BONUS: @OfficeDynamics, if you like our blog you will love our tweets! 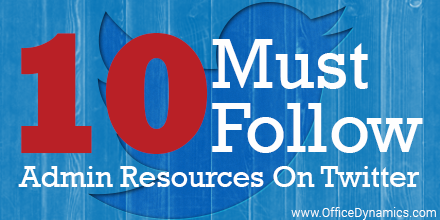 Your turn, what are your must follow admin resources on Twitter? Share in the comments below. Tweet us for a follow back!